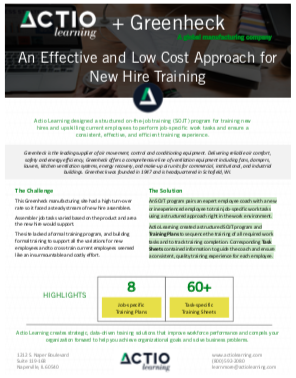 Actio Learning designed a structured on-the-job training (SOJT) program for training new hires and upskilling current employees to perform job-specific work tasks and ensure a consistent, effective, and efficient training experience. Greenheck is the leading supplier of air movement, control and conditioning equipment. Delivering reliable air comfort, safety and energy efficiency, Greenheck offers a comprehensive line of ventilation equipment including fans, dampers, louvers, kitchen ventilation systems, energy recovery, and make-up air units for commercial, institutional, and industrial buildings. Greenheck was founded in 1947 and is headquartered in Schofield, WI. An SOJT program pairs an expert employee coach with a new or inexperienced employee to train job-specific work tasks using a structured approach right in the work environment. Actio Learning created a structured SOJT program and Training Plans to sequence the training of all required work tasks and to track training completion. Corresponding Task Sheets contained information to guide the coach and ensure a consistent, quality training experience for each employee.